Set of Torx and Allen bits (from the nearest Halfords en-route) and a decent set of drivers and you are all there. Been a while since posting but i want to put a rear top box on the bike. I have the thick 2 arm grab handles on at the moment with the clear plate that bridges them, which the tail bag fits on nicely. 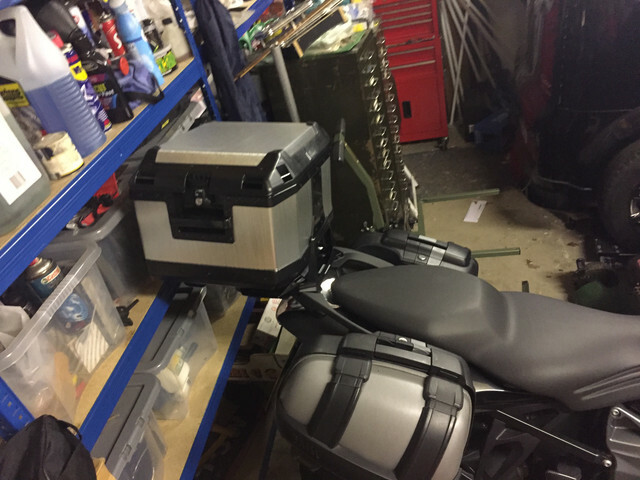 Question is, what do i need to fit, say, a givi box, besides the monkey plate ? Hepco and Becker do an adaptor plate for that BMW rack so you can fit any of their own H&B boxes - which is what I did. I get to keep the OE look of the BMW racks arms (can't stand the SW Motech or H&B metal rack) but do get a "proper" box on there. I don't beleive givi do an adaptor for that plate so you'd have to roll your own solution. Givi ut805 35l ,highly recommended for quality. I hate hard cases (top boxes) . Had a v47carbon for only 8 months worked experience regarding bikes appearance and handling over 160kms that is. That's a good option - I may yet get one and add it to my current setup (strapped to the seat), I prefer hard cases so I can leave them "secured" (as much as is possible) to the bike and wander off without carrying my lid / gloves etc. He might even have a spare subframe if the rivnuts came loose. If it matters what gear you’re in, the engine’s too small. Stop looking at the Avatar..
All went well, a little chilly and the usual tossers on the roads but quite a lot of considerate drivers which is good to see. Took my torx and allen set and fitted while i was there. Perfect fit and only took about 30 mins. only saw the guy for 5 mins, his Mrs had flu so i never went inside the house. Massive saving on the V47 but seem to have some unknown screws and bolts left over that don't fit anywhere. Not sure if anything changed from an 11 to 16 plate. But anyway, well happy. Didn't fancy strapping it to the bike to bring it 3 hours home. K1300S (Bullet) UK - What a bike !